But this year, there’s strong competition! G&T Fest is the new kid on the block. Running alongside TEAFEST, it’s up to you to pick your drink of choice to help people living with a brain tumour. Whether it’s a cuppa or a G&T, having a drink with friends is one of life’s simple pleasures. And it is often taken for granted. A brain tumour diagnosis is isolating: loss of mobility, fatigue and communication challenges are just some of the things that can make life with a brain tumour lonely. So from Monday 18 – Sunday 24 February, whether it’s for a cuppa or a G&T, join us to let the 60,000 people living with a brain tumour know they’re not alone. Tea or Gin – the choice is yours! TEAFEST is the annual fundraising and awareness campaign, where you have a cuppa and cake with friends, family and colleagues to drive the conversation on brain tumours. However, we know that tea isn’t everyone’s drink of choice. That’s why for 2019, we’re launching G&T Fest. With Gin now the nation’s favourite alcoholic drink, we know that lots of people prefer to meet up for a Gin and Tonic rather than a cup of tea. If you’re one of those people, you can sign up today and request your G&T Fest welcome pack. 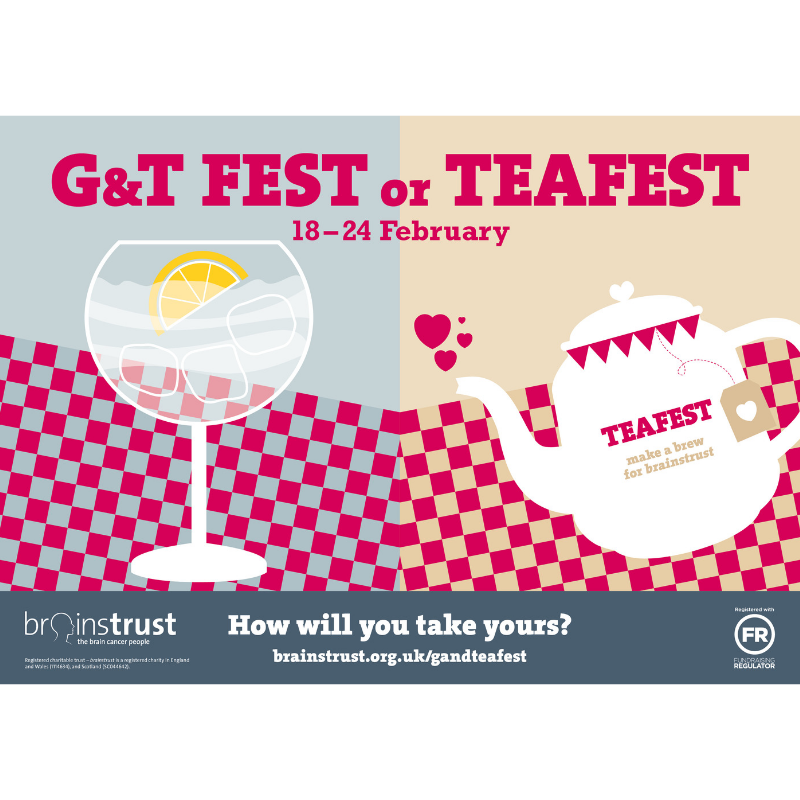 Whether it’s TEAFEST or G&T Fest which tickles your fancy, signing up is easy. Just fill in the form below, and tick which campaign you would like to support. We’ll send you the right welcome pack, full of fundraising and awareness tools that you need to make your event a huge success. Encourage as many of your friends, family and colleagues to do likewise, and from 18-24 February, join us to see which campaign raises the most money to support people living with a brain tumour. Visit their website to register your event and get your fundraising pack today!